I'll admit, my shoes are not organized in the bottom of my closet. Maybe yours are. Either way, you can play a simple game with your toddler. Take out of your closet 6-8 different shoes. 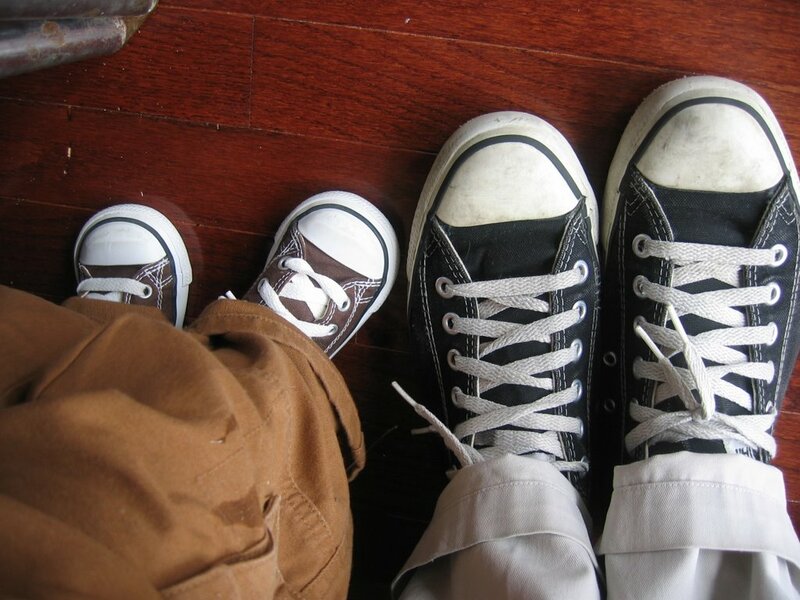 Hold up a shoe (say the color or style) and tell your toddler to find the other one and place them in a match on the floor. Very simple but it is fun to watch them "hunt" for the right shoe. Can you tell what shoes I love? Sweet. I have some nice lime green and pink Saucony's. Love 'em. Nice idea. Maybe when we move and get a closet I can do that with the little man. ;) Right now most of my shoes are in a box somewhere in storage. I feel for you! Not knowing where all of your loot is, is so frustrating. Hip hip hooray for lime green and pink Sauconys. this is such a great idea, i'm playing this with micahlyn tonight. you are awesome. thanks.